In 2007, thanks to David Zlesak, I began working with the AgCan Kordesii breeding variety L83. My main interest in working with L83 was to improve Blackspot resistance in my work, but there was a likelihood that improvements in Winter hardiness might be had as well. From the 2007 crosses I made, two groups stand out as having at least two or three selections that show both extremely good Blackspot resistance (near immunity) and apparent Winter hardiness (based on my limited experience). It should also be noted that several selections have good to excellent color and attractive bloom form. All have excellent vigor and attractive foliage. About 5 plants have been kept from the cross of ('Penny Ante' X 'Tradescant') X L83, including the fire engine red 77-07-23, which was used to a limited degree in 2009 breeding. 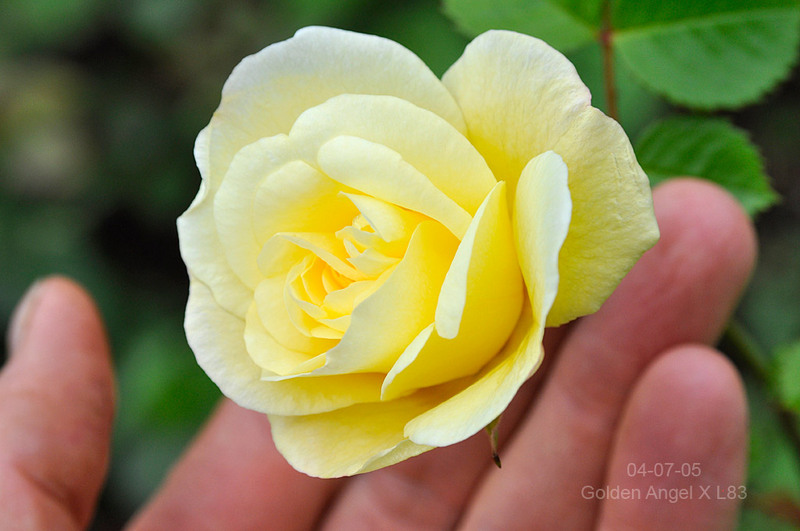 Illustrated here is the best yellow selection from 'Golden Angel' X L83, numbered 04-07-05. Some of you have probably noted that this is a cross of a triploid X a tetraploid, and so it is possible that the 04-07 selections are a mix of triploids and tetraploids. Some of these set open pollinated seeds last year (which I allowed to happen in order to determine fertility) and seeds were saved and a percentage have germinated. I am now starting to put select pollens on this yellow cultivar with the hope of moving forward with a Kordesii derived yellow breeding line. There is certainly a lot of room for improvements in both Winter hardiness and disease resistance in yellows! For now, I am limiting myself to using other first generation L83 hybrids to breed with this selection, and in fact will be crossing most of my best L83 selections with each other this year. Most are strong reds and medium yellows, so color results should be bright and rich with any luck. Very nice looking seedling and very nice cross. By the color I am assuming fades a lot in the sun, but it is a step in the right direction. So do the resistant L83 seedlings tend to have shiny foliage? I was just wondering since I can not breed for bs resistance because I have no bs to speak about and some of the seedlings I got using the pollen you gave me tend to have very shiny foliage. If their is a correlation I thought I could use this as a marker. Not a totally accurate maker but a maker none the less. The seedlings I have are a mix bag in terms of powdery mildew is this also your experience? Good luck with your seedlings. Have you thought about using a wichurana shrub like your Mel's Heritage on these seedlings? Yes, this seedlings fades to a very pale yellow as it ages, as one would expect of a seedling that got only one copy of its particular gene for yellow. There has been a mythology about a correlation between disease resistance and glossy foliage, and I have not found this to be true in my garden. Some of the glossiest-leaves varieties I grow (named varieties by other breeders) are some of the most tragically disease prone of all, and some of the completely matte-leaved roses have extremely good disease resistance. So I think this is a myth that doesn't bear placing a lot of trust in. Westerland shows promise as a breeder. Followup on post from three days ago. How tiny does tiny get? ?